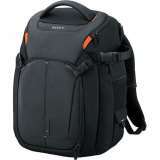 Protect your a DSLR camera with this backpack. The padded interior and dividers help protect your camera, personal computer and up to three lenses from dust and scratches . Color-coordinated body case make it easy to enjoy the portability of the NEX-C3 in style.